Send Morning Ablaze to Chennai. Gifts to Chennai. Send Flowers to Chennai. 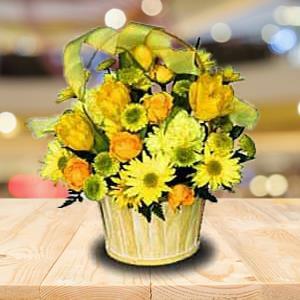 Description : Set the morning ablaze for your loved ones in Chennai with this fully yellow and bright basket of Gerberas, Carnations, Roses and Daisies. You can be sure that it will cheer up the recipient in no time. Thus, send this bright arrangement of 24 lively flowers decorated with ribbon through Gift2Chennai.com and brighten their day. You can also send this basket with other Gifts to Chennai as well.